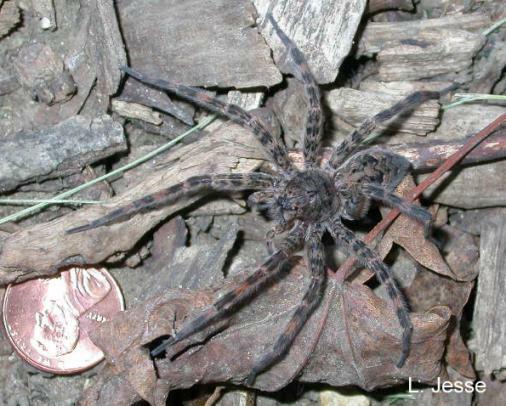 Wolf spiders and fishing spiders are the largest, and also among the most common of the spiders found in Iowa. Both are outdoor species that do not usually live indoors. They are, however, an occasional "accidental invader" that will wander into houses and buildings by mistake. Wolf spiders and fishing spiders have good vision and actively hunt and pursue prey during the day. They do not capture their food in a web as do other common spiders with poorer eye sight. Wolf spiders are common in almost all terrestrial habitats, but are usually found in areas of shrubs or tall grass where a plentiful insect supply is available. They run over the ground or on plants in search of prey and pounce upon the victims with vigor and power. Wolf spider mothers carry their large egg sacs around with them. 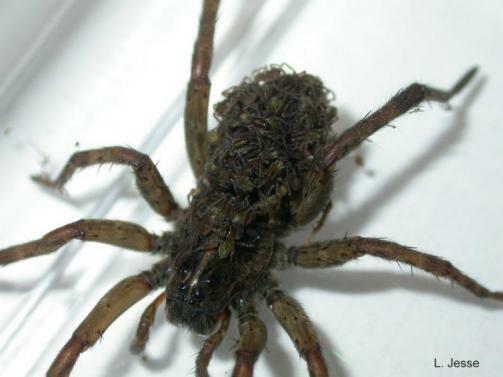 When the young spiderlings hatch they climb onto their mother's back and ride around until partially grown. Fishing spiders are amphibious and are typically found in moist areas, especially along the edges of streams and lakes. They have the ability to skate across the surface of the water and will even dive beneath the surface to feed on small fish, tadpoles and aquatic insects. The majority of their food, however, is large terrestrial insects found on vegetation at the water's edge. Wolf spiders and fishing piders are not poisonous, though as with all spiders, bites may cause reactions in certain individuals. The presence of these spiders inside a building is usually a case of accidental invasion and is particularly common in the fall of the year. Spiders that can be successfully trapped in a large jar can be taken back outside and released. Otherwise, the only necessary control is to swat or spray the invaders with a household aerosol and then discard. For what it is worth, the Golden Guide, Spiders and Their Kin, says that wolf spiders make nice pets. Water must be provided to wolf spiders kept in captivity.